No. 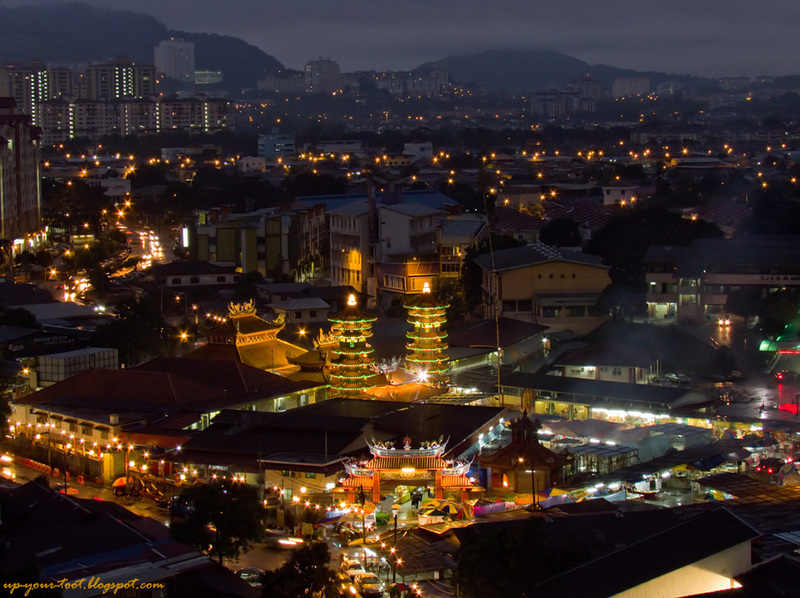 1 - The Nine Emperor Gods Festival is synonymous with rain over here. 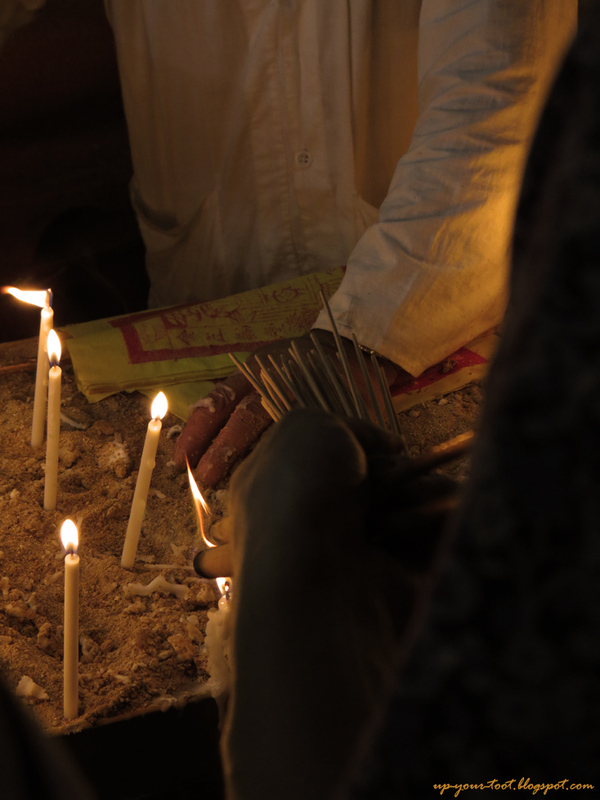 Before the festival starts, it will rain, after the procession, it will rain. After procession, sure will rain. Before the feeding of the Heavenly Soldiers, it will also rain. Coincidence or otherwise, I let you be the judge. Woke up this morning to the sound of falling rain..See, it is easy to predict when it will rain during the Nine Emperor Gods Festival. A wet and smoky morning for Ampang. View of the Nine Emperor Gods Temple at Ampang. The rain had just dropped to a light drizzle when this photo was taken (~6.30am) and you can see mist/low lying clouds enveloping the hills behind the temple. No. 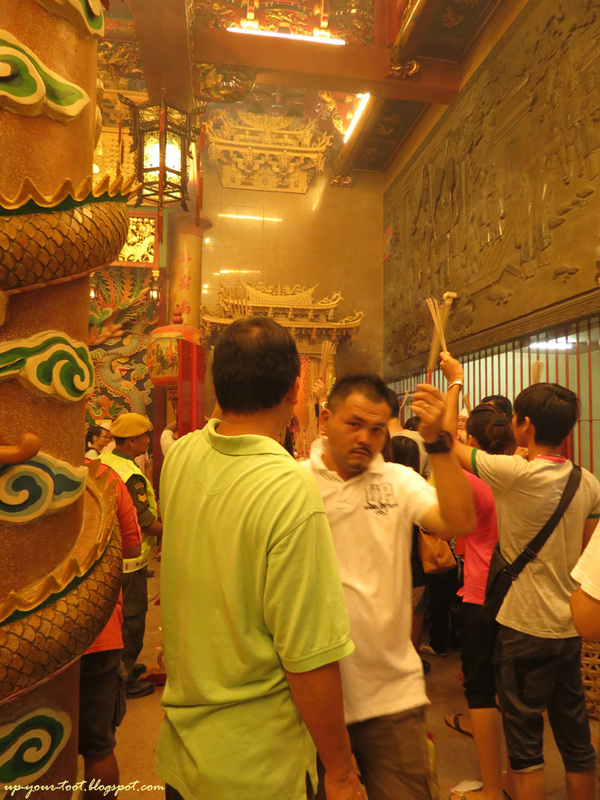 2 is easily understood - will all the joss-sticks and joss paper being burnt, smoke is a signature of this festival. Not only that, the kitchen fires too are well-stoked to feed the huge number of devotees. Which gives good opportunity for photo taking, coupled with No. 3. I just hope that the NOAA-18 satellite does not pick up and mark Ampang as a hotspot...then we no longer can point our finger at Sumatra every time it gets hazy. Fire! 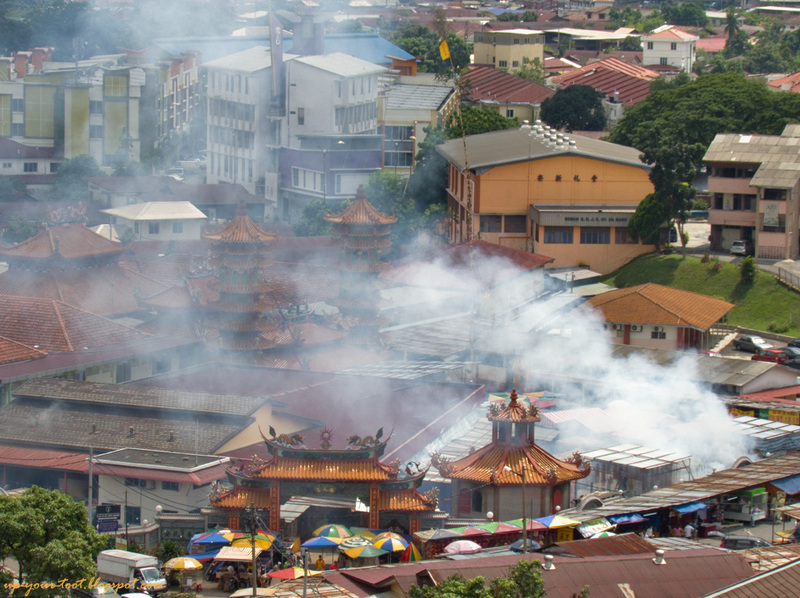 Fire!...Nolah, just smoke from Kow Wong Yeh temple, Ampang. 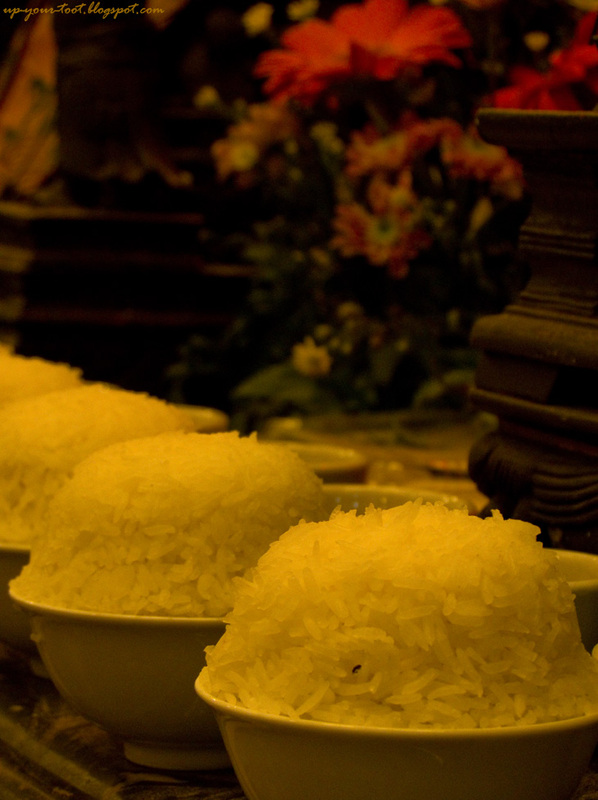 Rice is nice - offerings on the altar table to the Jade Emperor. "Hmm, just plain white rice? Where is my royal banquet??" said the Jade Emperor. No. 3 - Unbelievably large numbers of people would turn up on the first day (and most of the days of this festival). This results in long queues of cars and buses waiting to get into the parking lots. Luckily there are ample space available for parking, and if you don't mind walking a bit, more space is available at Bandar Baru Ampang. I know this is kitsch, but I just can't help myself. 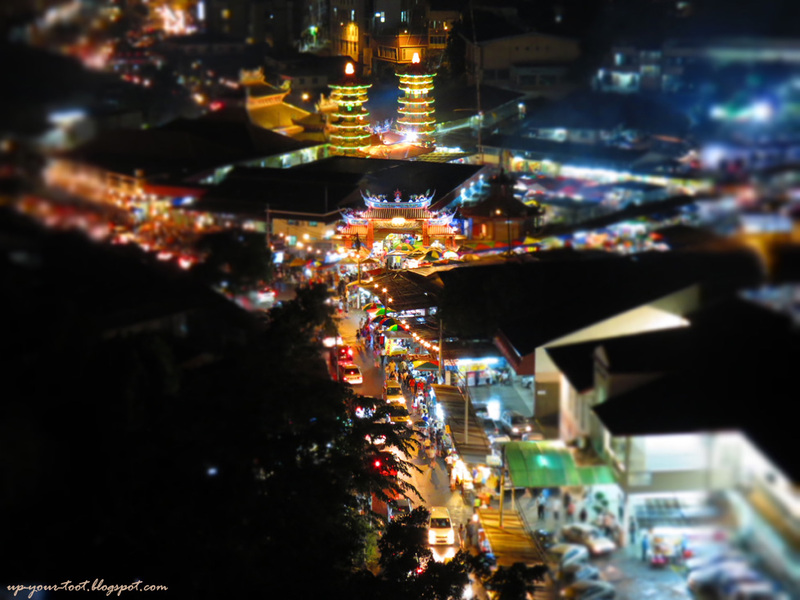 Here's a shot of Ampang Nan Tian Gong on the night of the first day of the Nine Emperor Gods Festival 2012 using the camera's Toy Miniature effect filter. The Door God keeping a watchful eye over the continuous stream of devotees that pour into the temple. He must have a pair of pretty tough eyes not to water and sting with all this smoke floating around. The queue to pay respects to the Emperor and other deities are usual long, so your patience is very much appreciated. 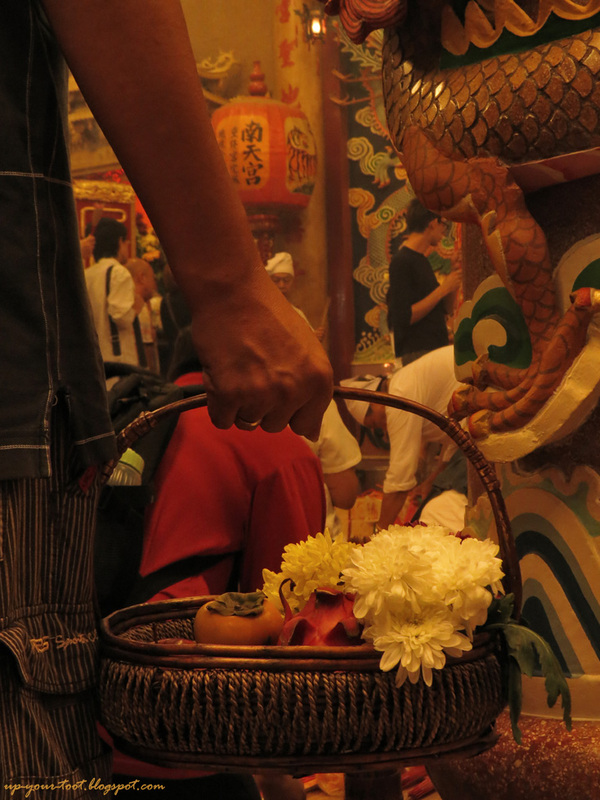 Gifts for the Emperor - Dragon fruit, persimmons, and flowers...all packed in basket. 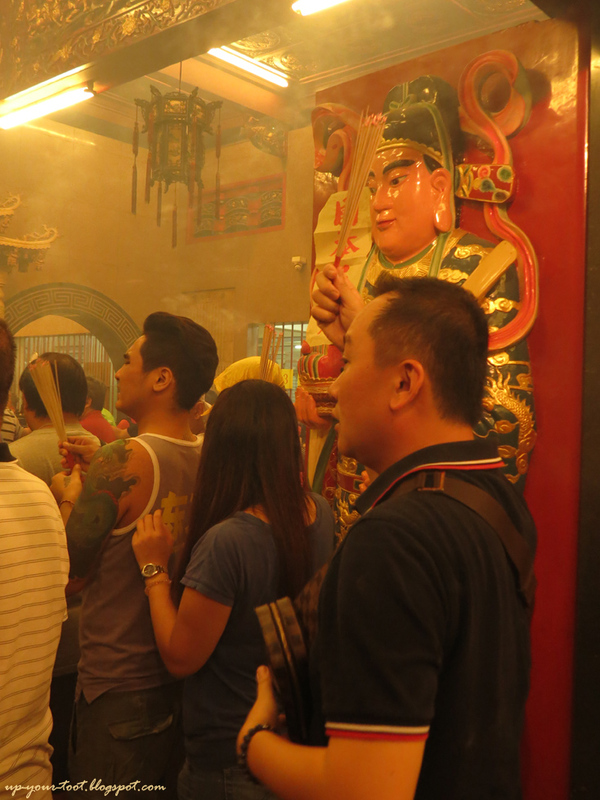 And just like any VVIP or royalty, you got to wait for your turn to meet and greet the Nine Emperor Gods. 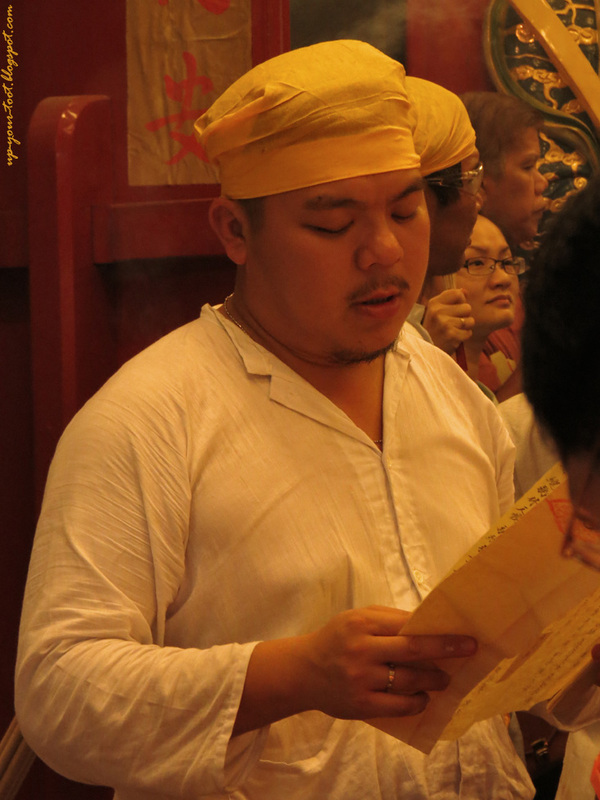 One of the Taoist priest conducting a prayer session. And no, he is NOT, I repeat, NOT giving the finger to the person that stood in front of him. On Tuesday (16th Oct 2012), the procession to invite the Finance Minister will take place. So do come by and have a look if you have the time.